Just back from an amazing trip to Manchester where I toured a lot of spots of music lore. Sadly, the Hacienda has been replaced by an apartment building, but on the back of the building there's a timeline of all the acts who performed there, and this quote from Ivan Chtcheglov that apparently inspired the utopian, forward-dreaming Tony Wilson when he named the place that would transform club and music culture: "Now that's finished. You won't see the Hacienda. It doesn't exist. The Hacienda must be built". 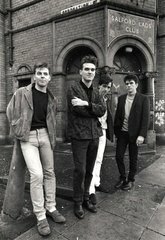 One apocryphal spot I did not get to visit (next time) was the Salford Lad's Club of Smiths' fame. On a Smiths tip, however, I did find out that the elusive, silver-voiced contrarian Morrissey will be guest DJing on KCRW's Morning Becomes Eclectic this Friday, August 29th. The time is not certain, but will probably be around 9 a.m. PST. You can tune in live through iTunes (listed under Public) or through the player at kcrw.com. What is Morrissey listening to now? This should be pretty key. Erykah Badu's album "New Amerykah" gets a savvy review from Sasha Frere-Jones in the New Yorker--it's a invaluable primer for where Badu is coming from and where she's going, both musically and thematically. The album is challenging and strange, angry and consoling, and if you manage to get past the strange, deliberately dissonant interludes between songs you'll find a potent and intoxicating array of music. My current favorite is the metronomic "Soldier", a call to awareness and action for a populace numbed and pacified. There's a euphoric swell of organs behind "Baptized when the levees broke" that cuts into your heart. It's followed by this passage that refers to Harriet Tubman's practice of forcing slaves to participate in their liberation; pulling a gun on them she'd say, "you march or you die". "we gone keep marching on/till we here that freedom song/and if you think about turning back/I got the shot gun for your back/and if you think about tunrnin back?I got a shotgun on ya' back/(harriet style)"
Murder Ballads, the Nick Cave's collaborative album which includes "Henry Lee" done with PJ Harvey, was released in 1996, around the same time that the two artists - so says the vague Internet - had a brief but intense relationship. Some accounts claim this was an affair while Cave was with another woman; others do not reflect any infidelity. (It was perhaps Harvey's only relationship known to the public, and may not have been very secretive very long). By all accounts, Harvey ends the relationship, and Cave is devastated. Outside of the Luther Vandross version of the same song (Download luther_vandross_superstar.mp3)I’d say Sonic Youth’s ”Superstar” is the most rad and poignant Carpenters cover.